An airplane with a wingspan greater than the length of a football field just flew for the first time — putting us one step closer to more affordable spaceflight. The largest airplane in the world, the Stratolaunch, took off from Mojave Air and Space Port in Mojave, Calif., on Saturday for its first test flight. According to a news release, it reached a maximum speed of 304 kilometers per hour (189 miles per hour) over the course of the 2.5-hour-long flight, soaring as high as 17,000 feet before landing safely. Microsoft co-founder Paul Allen started Stratolaunch Systems in 2011 with the goal of building an airplane massive enough to carry rockets and other spacecraft to low-earth orbit. This way of reaching space, known as air launch to orbit, has numerous benefits over traditional spacecraft launches. 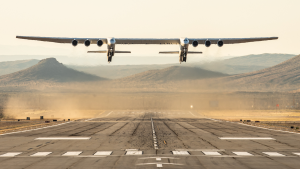 Because the plane takes off from a runway, it “can circumvent bad weather, air traffic, and other variables that cause delays with traditional ground launches,” according to Stratolaunch’s website. And because the Stratolaunch is reusable — it lands after each launch — the company doesn’t need to charge as much for its launch services, further democratizing access to space.